Road leading to Assam CM’s Dibrugarh residence in shreds! 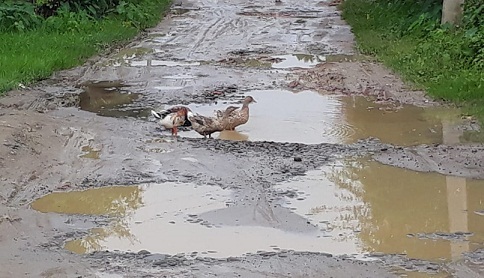 The road leading to the Assam Chief Minister (CM), Sarbananda Sonowal’s residence at No 1 Lakhi Nagar in Dibrugarh is in a dilapidated condition and dotted with potholes for the past several years. Sonowal may have become the CM, but the road still remains in shreds. During pre-monsoon showers, the condition of the road becomes worse. The residents of No 1 Lakhi Nagar have complained that during monsoons, it is hardly possible to walk on the road, but repeated pleas to Sonowal and the local MLA, Rituparna Baruah, to construct the road till date has fallen on deaf ears. The residents also complained that the stretch of road just near the CM’s residence has been blacktopped and the remaining portion of the road remains “muddy and squelchy”. “We had lot of expectations from Sarbananda Sonowal when we voted him to power. But, here is a person who has not been able to construct the stretch of road which leads to his residence. This best exemplifies how incompetent he is. We still urge him to construct the road pronto,” stated Gobin Changmai, a resident of No 1 Lakhi Nagar. Changmai added that earlier they had met the local MLA Baruah and had requested him to construct the road, but in vain. Every year during monsoon, it is the same story. It becomes difficult for people to negotiate the road even if there is a light drizzle. Sunil Rajkonwar, president of Lakhi Nagar Unnayan Samiti and president of Anchalikbadi Asom Gana Parishad(AAGP), alleged that the said stretch of road is “pitch dark as there are no street lights and it becomes difficult for people to walk on the road at night”. Rajkonwar lamented that though the people voted for the BJP in Assam expecting they would really bring in “change, but they have totally failed to deliver.